It's probably not a very popular opinion round these parts, but I have to admit I enjoyed the first Parquet Courts album. There was a cosiness to them, a bit like when you notice ripped jeans are back on the streets for the first time in a while. Parquet Courts' brand of raggedy button-down garage rock recalled something largely absent from the rest of the day's musical landscape. In a time when your average indie band strives to incorporate every disco, r&b or electronic influence they can, here was an act that prized the homegrown DIY formula born out of punk and carried through the generation X era of grunge and college rock. For those raised on the Matador and Drag City rosters, Parquet Courts provided a welcome trip back to that foreign country known as the past. And this is where the cynics pipe up: "But why on earth would you want to listen to a band who sound like a heap of old bands from your youth?" And I'll say to the cynics, I'll say: "Well, they've got good songs. One of them's about walking around town with the munchies and another's about getting psychiatric help for a lack of inspiration. Plus it looks really great alphabetised next to Slanted & Enchanted'. It's a funny, pathetic thing, nostalgia - an emotion that has been hacked into by the music industry for decades, wielded with both ironic distance and dripping sincerity. It's hard not to be critical of those seemingly suckered into its retromanic vortex. Nostalgia is an armchair, the leafy retirement home of culture. Pop music, we're told, shouldn't be about the past, it's about the now. And yet as a species, we seem hopelessly susceptible to it. Look at the popularity of Haim or the Horrors – bands who trade in a supposedly modern sound which is actually woven from a very specific thread in the pop timeline. This extends all the way to cutting-edge dance acts like DJ Q, whose excellent 2014 album Ineffable feeds directly from a tract of late-90s UK garage. There is, of course, nothing wrong with a bit of nostalgia, in fact there's no escaping it. To reject it would be both hopeless and unnatural. Anyone accusing Parquet Courts fans of being traditionalist drones should first look at their own tastes and ask themselves whether the key draw for that music is in its influences, or whether it's appreciable on its own terms. Nine times out of ten, the answer will be the latter and the same goes for Parquet Courts. So case closed. But this nevertheless brings a dilemma to Sunbathing Animal. Being a roughly similar affair to Light Up Gold, is there any reason to enjoy one and not the other? It's hard not to describe Parquet Courts in terms of the past. You know you're in trouble when your reviewer starts wanting to write things like, "D. Boone fronting Pavement in a tribute to the third Velvet Underground LP". Worse still is when we can't reasonably go the whole hog and append "on acid!" to that phrase. The truth is Parquet Courts are a fine band – easy to like, but difficult to love. The fact they sound like Pavement et al. was initially forgivable, perhaps even perversely refreshing: "I enjoy the Pavement sound, therefore I enjoy the Parquet Courts sound". The thing is though, that I never treated Pavement as sonic wallpaper. I don't listen to the Minutemen because I want to hear "the Minutemen sound". There's more to liking the Velvets than saying simply "I like the songs". Strip these acts of context, character and creative momentum and what you're left with is a textured husk, something that looks and sounds like the real thing, but isn't nearly as exciting. I won't go so far as to call Parquet Courts a "husk", but all too often we're made painfully aware that this is a band intent on recreating a particular sound yet unwilling to move on from it. Yes there are some pretty good songs here, as on Light Up Gold, ones that do a pretty good job of replicating a bunch of great bands. This is the Pavement album where Spiral Stairs wrote and sung all the songs; Double Nickles On The Dime's underachieving cousin; Black Flag with a weed habit. 'Dear Ramona' is charming, shambling, with a raucous lead workout towards the end. They describe themselves as a New York band and the song is indeed reminiscent of the Velvets, if lacking that band's detached arty cool. As Texans who relocated to Brooklyn before forming, this makes sense. It's a look at the city through suburban eyes, much in the same way Jonathan Richman also fell for the Velvets and moved to the Big Apple from Massachusetts. 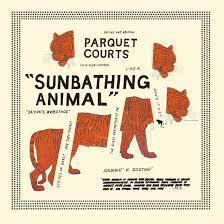 Unlike Richman though, Parquet Courts come across largely apathetic to their surroundings. There's none of the wide-eyed wonder of Richman, instead they come across as studiedly po-faced, a user's guide to slacker nonchalance. Lines like "This lady is a hypnosis poet and when she speaks her words weep like rain" are superficially intriguing, but on closer inspection come off like a Malkmusian homework assignment. The two long songs, 'She's Rolling' and 'Instant Disassembly' are again decent attempts at lo-slung dirginess, and yet they do little to justify their 6-7 minute lengths, turning from dirge to drudge on repeated listens. Even the more uptempo songs, 'Ducking And Dodging' and the title track, are initially exciting but never quite attain that sense of giddy mania that feels effortless among comparable acts like FIDLAR or even the Black Lips, bands who sound relevant to today while still harnessing that indie-punk spirit. I'm not saying it's wrong to listen to Parquet Courts, nor that they have necessarily failed in their mission, but be aware that this is a re-enactment pure and simple. It is a crystallised definition of "record collection rock". The difference between Parquet Courts and the aforementioned Horrors and Haim, is that the latter bands recontextualise rather than ape their influences. As such, one is left to wonder why one should listen to Sunbathing Animal when you could get a pretty much stronger hit from listening to Marquee Moon, Wowee Zowee, White Light White Heat or any number of old favourites where the bands in question ran off their own steam.